Our facility has always believed the saying, "Behind every great stallion is an even better mare" and each and every mare we've ever acquired, we've felt the same. As we've aged, so have our mares, and our program. The mares we now hold on to, are our pasture pets(ornaments). They may still be producing, and maybe not, but they've earned the right to stay as long as we can keep them. Just remember one thing: I am not a professional photographer and without quality help in that field, for our area, it leaves me to catch the horses in their natural setting, but I am sure most of you horse gurus are able to see through all of that. Click here for Pal's Pedigree Impressive Miss Ogie--1989 Palomino Quarter Mare. 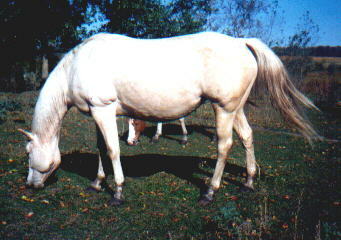 Pal is a cream colored mare. Doll headed, large liquid eye, she has the type of body that a person would kill for!!! She has been an outstanding broodmare for us, having produced 50% color, with some being bay, brown, buckskin and dun. Again of course, all were by Shiloh McCue. Her foals have been shown and have walked away with points guaranteed. We have lots of blue ribbons from this cross. This is a royally bred bloodline with numerous champions such as; Impressive(QH), Three Bars(TB)x5, Cutter Bill(QH), Poco Bueno(QH), Poco Dell(QH), and King(QH)x2. Pal has even produced a top earning filly(weanling) at a local sale barn. This mare will always produce a foal with a black mane/tail by Shiloh McCue. Pal has also been tested HYPP N/N. This mare is not for sale. I doubt she ever will be. 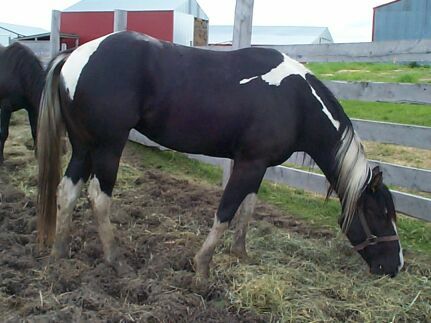 Click here for Honey's Pedigree Honeysweetenedraisin--1998 Black Tobiano Paint Filly. Pictured here at 3 years old. Her sire is Joeys Wagons West; a Double Gened Black Homozygous Black Tobiano. With her white legs and white over the back, she was a nice change of pace to our past overo bred foals, and although I've raised tobianos off and on prior to 1992; Honey was the one who sparked our interest enough, to get back into tobianos. She's got personality, a heart of gold and we're finding out, she also has a mind, to boot! Tuffernhel, Sonsational Too breeding. Honey will remain a pasture ornament, even if we never get too active in riding her. She is currently NOT FOR SALE!! !